An 11-year-old is charged with murdering two people in New Hampshire. Here’s what we know. Authorities say the victims, a 50-year-old woman and 48-year-old man, died from gunshot wounds. Citing the state’s juvenile laws, officials say they are prohibited from releasing the name or gender of the child or the 11-year-old’s relationship with the victims, 50-year-old Lizette Eckert and 48-year-old James Eckert. The juvenile was initially charged with one count of second-degree murder and one count of attempted murder. 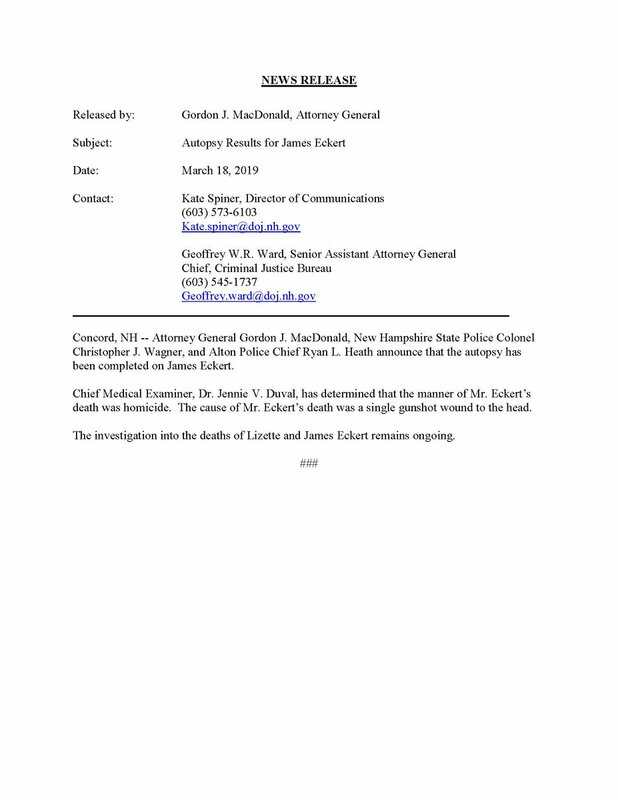 Late Tuesday afternoon, the New Hampshire Attorney General’s office announced an additional second-degree murder count against the child in connection with the death of James Eckert. Here’s what we know about the incident. The Alton Police Department responded to a 911 call reporting a shooting at 76 Dobbins Way around 7:30 a.m. on Friday, according to the AG’s office. Officers found Lizette Eckert dead at the residence when they arrived. She suffered “a gunshot wound,” the AG’s office said. James Eckert was transported to Portsmouth Regional Hospital in critical condition, suffering from “gunshot wounds.” He died late Friday. Senior Assistant Attorney General Geoffrey Ward said during a Friday press conference that the Belknap Regional Special Operations Group responded to the scene along with local police and assisted in the search around the property for the suspect. The child was charged Friday under juvenile laws with one count of second-degree murder and one count of attempted murder. The cause of death for both Lizette and James Eckert were single gunshot wounds to the head, and in both cases the medical examiner determined the manner of death was homicide, the AG’s office said Monday. Ward declined to describe the type of gun used in the shooting or if there were any other children in the home at the time, citing juvenile laws. “The juvenile process is a closed process,” he said of the case’s next steps. 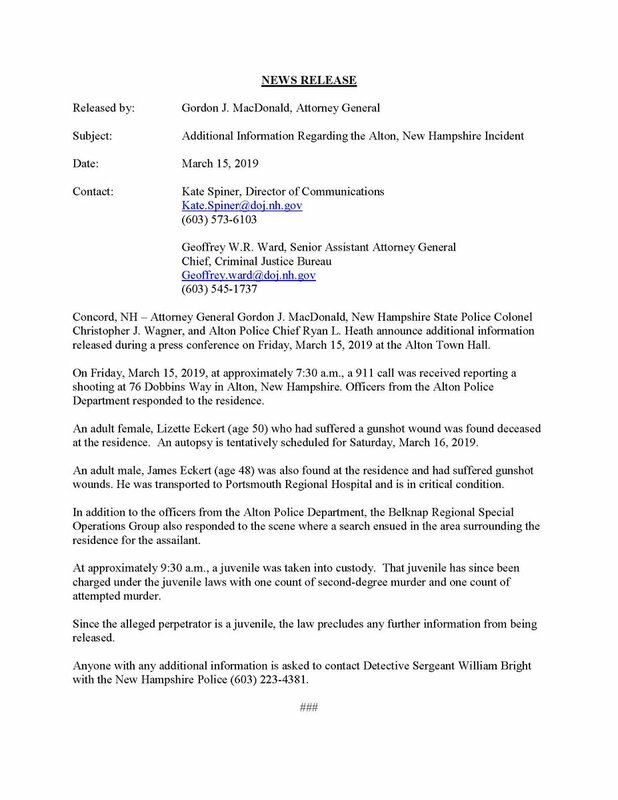 Anyone with additional information about the incident is asked to contact Detective Sergeant William Bright with the New Hampshire State Police at 603-223-4381. “The investigation into the deaths of Lizette and James Eckert remains active and ongoing,” the AG’s office said Tuesday. The Eckerts were married with three children, Samuel Hollo, the pastor at Community Church of Alton, told The Boston Globe. All three of the children, an older daughter and adopted 11-year-old twin boys, were homeschooled by the couple, he said. According to the station, the Eckerts raised horses and other animals on their large plot of land. James Eckert had a chiropractic office in Alton, according the Globe, and the family belongs to St. Katherine Drexel Parish in town. The couple, both chiropractors, previously lived in Raymond, Maine, the Portland Press Herald reports, and operated Innate Chiropractic in South Portland from the late 1990s to the early 2000s. A bankruptcy filing for the Eckerts from 2011, reported on by the Globe, listed the family as owning at the time a 12-gauge shotgun, two Kel-Tec P-3AT handguns, and a .22-caliber rifle. A vigil was held Sunday by the Revolution United Soccer Club, which the family was involved with, according to WMUR. Director of coaching Cory Halvorsen told the station the Eckerts were devoted parents. Friends of the family are working to set up a means of supporting the Eckerts, according to NHPR. Halvorsen told NHPR relatives have flown in to be with the family. A combined wake for the couple will be held at the church on Thursday, with a funeral mass to follow on Friday, the Laconia Daily Sun reports.